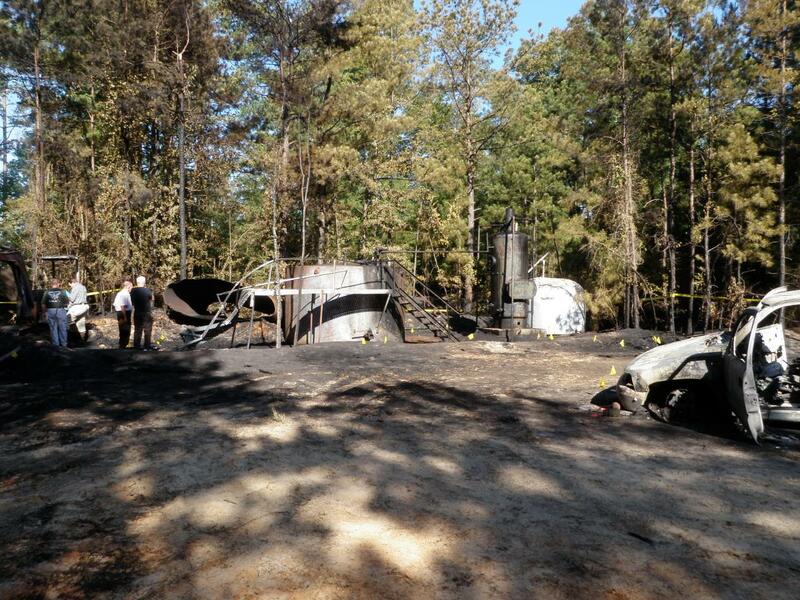 The Arkansas Department of Emergency Management notified the Phone Duty Officer of a fire and explosion at an abandoned crude oil tank battery near El Dorado, AR. The tank battery which has been out of service for years contains several steel AST's which were thought to be empty. The tanks were being dismantled with an acetylene cutting torch and the explosion resulted in 3 fatalities and started a fire. OSC McAteer and START Contractors have been mobilized to the site. At approximately 1700 hours on 21 May 2012, Mr. Jerry Thomas of the Union County Office of Emergency Management, El Dorado, Arkansas notified the National Response Center (NRC Report No. 1012214) of an incident involving an abandoned tank battery located approximately 4 miles northwest of El Dorado, Union County, Arkansas that had occurred at approximately 1530 hours on 21 May 2012. Mr. Jerry Thomas notified the NRC in lieu of notification by the potentially responsible party (PRP). The PRP is Long Brothers Oil Company, a private enterprise from Norphlet, AR. The Long Brothers Tank Battery Fire site is located in a rural sparsely populated, wooded area off Moody Lane northwest of El Dorado, Union County, Arkansas (33.240058N; 92.746692W). The site consists of a small oil well (Lisbon Oil Company – Dumas #1), one gun barrel tank and two 200 barrel above ground storage tanks. Crude oil was collected in the two on-site storage tanks and moved off-site via transmission pipeline. According to the PRP the tank battery, including transmission line had been unused and abandoned for some time. The PRP stated that a field crew working for Long Brothers Oil Company arrived at the site sometime before 1500 hours on 21 May 2012 to commence decommission and dismantling of site structures and prepare the site for anticipated future activities. According to Mike McGough from the Union County Sherriffs Office sometime between 1500 hours and 1530 hours on 21 May 2012 a report from the Lawrence Electric Company of an explosion and ensuing woodland fire were made. County and local officials responded to the incident and discovered that all three Long Brothers Oil Company field crew members had been killed in an explosion involving one of the 200 barrel on-site storage tanks. Purportedly the storage tanks were thought to have been empty and it is initially suspected that the field crew was using power tools to size the tank introducing heat and an ignition source, creating an explosive atmosphere inside the storage tank. 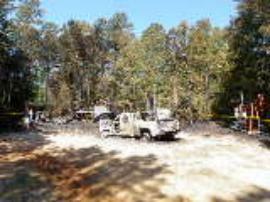 The explosion ignited the surrounding light woodland/vegetation, fire departments from El Dorado, Cairo, Norplet, Fathers Chapel and personnel from the Arkansas Forestry Department implemented a fire line and used approximately 3,000 gallons of water to bring the fire under control. At 1700 hours on 21 May 2012 and the time of notification to the NRC and EPA, the fire had been extinguished at the ignition point but fire fighters continued to clear brush to keep the fire from spreading further.